Twenty years ago, I worked as a full-time manager of a high-profile political campaign for a good, honest, humble man. He won. Yet instead of being invited onto the new elected official’s staff (which was expected), he offered me a pretty menial job at a supporter’s business. Interestingly, 10 years later, the elected official resigned and many staffers were fired amidst a scandal, which leaves me grateful I wasn’t hired there in the first place. Since then, my wife and I have had quite a few opportunities where it would have been easy to trust another person. We listened to the Spirit, and in many cases, we didn’t. I’m thankful for the Spirit’s guidance throughout my life. Today, many people are concerned about the state of our society, and the challenges upon us individually and collectively, as we barrel towards an inevitable rendezvous with Zion. Of particular concern is how we’ll keep our families safe amidst the tremendous trials and tribulations which will come upon us. Many proudly boast of their trust in inanimate objects or other mortals to ensure their physical and/or spiritual survival. Last fall, we held our Unblog Family Reunion and “Visions of Glory” was published. I’m not sure about you, but two of the messages I got from the book and the reunion was (1) that I needed to greatly accelerate and amplify my spiritual preparedness and (2) trust in the Lord. As I frequent various forums, blogs and websites, this conflict — between trusting in things/other mortals on one hand, and God on the other hand — seems to be intensifying. In fact, I see many (who are encouraging others to trust in God) being persecuted and castigated by other latter-day saints. “My first view was that we had entered a mountain pass. I don’t know where it was. On our right were tall cliffs. The stone was dark, with trees and bushes growing out of it. We were standing in tall grass and bushes at the bottom of the cliff. On the hillside to our left a long row of military vehicles came into view. They had been waiting in ambush. Troops took up position at the entrance and exit to the canyon, trapping us inside. There were trucks with machine guns, several huge army tanks and half a dozen trucks with rocket launchers. They were mocking us and threatening us, telling us that we were all going to be dead in a few minutes. They taunted God, and said that this time even God could not save us; they were more powerful than God. These troops were from almost every nation that had survived – Asia, Russia, Europe and Africa. The soldier who was taunting us was shouting in broken English through a large bullhorn. They began to fire upon us. People from our company began to fall. “At times our enemies would approach our group. I would speak to them but they did not seem to see me because they didn’t reply or even look at me. They sometimes saw the group I was leading, but they never saw me. I would say to them something like, ‘There is no one here,’ or anything the Lord led me to say, and they would leave. We were never in any danger, but those with me trembled with fear because they were still on their ‘journey to Zion’ which involved long experience in learning to completely and absolutely trust the Lord. I could also create an illusion if need be. If we were standing before the soldiers, I could cause them to “see” us suddenly turn and try to run away in a different direction. They would fire and be satisfied that we had been eliminated. After such an illusion, they could no longer see us, and we would leave. They couldn’t even hear our voices or noise of our departure no matter what it was. These things were continually amazing to me, and I always glorified God in my heart, and I plainly told the people what had happened so they could enhance their faith in Christ’s protection and love. There was a law we followed. It was not a rule, but a law. When an individual or group threatened us, we knew their hearts. If there was any hope, even the slightest hope that they could be saved, even in the most telestial sense, we did not harm them. When we were confronted by someone who was fully ripe in iniquity, and who would never repent, then we were free to deliver them from mortality. Their death would then be a blessing to them because they could no longer add additional iniquity to their divine ledger. Without going into detail, let me add my (second?) witness to the last two paragraphs quoted above. I, too, will someday encounter several dangerous circumstances which will demand not the usage of any inanimate objects or trust in an individual, but instead, an unparalleled reliance upon God and the power of His priesthood. True, there may be some instances where I’ll have to rely on “people” or “things”; but such directions will be Spirit inspired. Based on the above testimonies, I encourage you, I plead with you, to aim higher, reach farther and attain greater. Focus not on man or anything man-made. Take the Lord’s yoke upon you, for it is easy and his burden is light. Envision yourself exercising greater faith, greater priesthood power, greater reliance upon He who is mighty to save. I know – I know – that as you do this, you will feel the Spirit in greater abundance and the Lord’s proximity to you closer. P.S. To “Rachael”, whoever you are…thanks for inspiring me. “patient in my afflictions”. I have learned some very important lessons. I have learned that even though I loved helping others it was very difficult for me to ask for help. 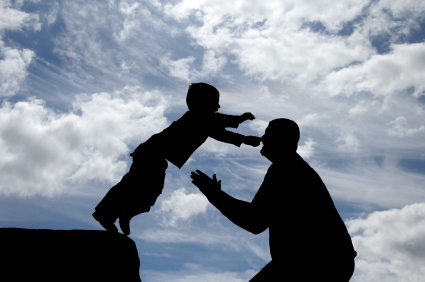 I learned that I needed others and hadn’t realized that my exceptional independence was a weakness in Father’s eyes. I hadn’t realized that relying on my intellect instead of my heart was a greater weakness than I could have ever imagined, or that I was doing that. I realized that I didn’t want to be dependent on anyone, and that this was a form of pride. I have learned to be more gracious in my relationships and to appreciate others in a new way. But one of the most outstanding lessons I have learned was that Father would walk by my side every moment that I would let Him. I have had such severe light sensitivity that I haven’t been able to attend church or go out. And wander around the house with sunglasses and often a blanket over my head. I had thought that this might cause my spirituality to suffer, yet Father knowing it was not my choice has provided me with even more spirituality than I normally have. I have learned to be appreciative of the gift we have to request ministering angels when our pain is so severe we feel we can not go on. I have learned to trust this lesson that I need in Father’s hands and not question when it will end. I have learned to have a childlike joy in each moment I am somewhat free of pain. I have been way too serious most of my life, and Father knew I needed a lesson in joy. I have tended to “reach beyond the mark” in my anxiousness to be “prepared” for the future. This was a weakness I needed to face as well. I have learned to love more, have more compassion for others, trust Father more, and many things. But I got on today needing a little upliftment and found this newest message and it was so helpful and touched my heart so deeply, I wanted to share my experience. Forgive me for focusing so much on myself. Thank you for being there, writing this reminding us of why we are here, and how our lessons are necessary to prepare us, and of the need to trust and not fear. Ann, your dream is inspiring! Eric, your posts are so appreciated!. This is my first comment, though I have been reading John’s blog for only a month before his passing, though I and most of my children have read his books and been greatly affected by them. My favorite paragraph in Vision’s of glory, Eric underlined wherein they are walking into Zion with nothing but the ragged clothes on their back, having fully given everything to do so — all attachments to and reliance upon worldly things, all worldly ideas, all false traditions, looking to others for inspiration and revelation, etc, etc. This seriously grabbed me as “The Way” into Zion and that we can choose to begin this journey now by detaching from the Babylon of idol worship (worshiping the ‘things’ we as a people have made with our hands) and to refrain from clinging to anything or anyone other than our God and His Christ, having absolutely no other God before Him. This has become clearer this past year as my own journey to ‘know’ Christ more intimately has invited me to look at my real core intents and motives for which I do or say anything. It has been a revealing walk and a shedding of many old ideas, perceptions, teachings and false beliefs. It has drawn me into a closer walk with Christ, calling upon Him and conversing with Him throughout the day, inviting him to show me the truth, turning to Him for forgiveness and asking Him with greater energy of my heart to fill me with His redeeming love, replacing my Telestial/Tree of Knowledge motives/intentions with His Celestial/Tree of Life/Pure Love. He is ever faithful to me and continues to pour forth His love and direction to me and all who seek Him and truly love Him. Another great pearl I have incorporated into my daily walk is wonderfully depicted by John in ‘Triumph of Zion’ when he wrote about the motives underlying our Visiting/Home Teaching (or anything else). Wow, did I ever experience an about face in regards to my experience visiting teaching and those I visit, and the surprising part was that I did nothing different, other than the reason and the purpose for going did a complete 180. Rather than give the details, for you can read it in his book, suffice it to say that some very simple alterations in my life with Christ as my guide, because I am seriously desirous and willing to look within and to get honest and see the truth about my intentions and motives and to give them to Christ to be purified, and to let go of the world with all its trappings and false ideas and seeking others love or approval rather than God’s, is altering my life and my daily walk, Hence it is shortening my journey to Zion, for Zion is only possible and can only be present if Zion is truly in us! Yes, if WE through the help and grace of our Lord and Savior, Jesus Christ, are ZION! Thank you Eric for writing this post. The days of “Visions of Glory” are coming upon us very soon. Relying upon Christ has been John’s inspired message as well as the brethren’s message from God as of late. The following quote from Heber C. Kimball comes to my mind when I read Spencer’s account and this post. “Let me say to you, that many of you will see the time when you will have all the trouble, trial and persecution that you can stand, and plenty of opportunities to show that you are true to God and his work. This Church has before it many close places through which it will have to pass before the work of God is crowned with victory. To meet the difficulties that are coming, it will be necessary for you to have a knowledge of the truth of this work for yourselves. The difficulties will be of such a character that the man or woman who does not possess this personal knowledge or witness will fall. If you have not got the testimony, live right and call upon the Lord and cease not till you obtain it. If you do not, you will not stand. Remember these sayings, for many of you will live to see them fulfilled. The time will come when no man nor woman will be able to endure on borrowed light. Each will have to be guided by the light within himself. If you do not have it, how can you stand? Do you believe it? Beautiful words Eric. The Lord seems to be letting me go through experiences that invite me to put my trust in Him. Unfortunately I have not been very good at choosing an eternal companion. I am going through my second divorce. Both of my wifes had affairs with other men, and now I am in a position where I need to rely on the Lord to lead me in the direction I should go. Rather than being willful, I want and need the Lord’s hand in the important decisions that lie before me. I get the feeling that He lets us go through experiences where we can put His love and goodness to the test, and if we put our trust in Him during those times, He will deliver. As I let Him deliver me time and again, I ill be prepared to trust Him in all things, including those hard times ahead. Kate – I find your comment amazing. I had the exact phrase impressed upon me, word for word, on the first of this month. It was after learning of some of the “best and brightest” leaving the church. My quick response to the Master was the same as yours. Last week I had a dream where I was at the base of a large overpass in a big coastal city. I had just left a group of women who had been engaged in normal worldly complaining about anything their minds caught hold of. I didn’t want to be present in the environment so I left. As soon as that thought entered my mind I found myself at the base of this overpass. I looked up towards the skyscrapers that were lining the streets. The sky was gray and there was a great storm of destruction coming from the ocean near by. I immediately knew that this was not a natural disaster type storm. This was total annihilation of the city and its inhabitants. It was a combination of water wind and an unseen Godly force. I knew what it was but I had no fear. Others in its path barely had time to know what was happening before they were consumed and destroyed. Due to the force of the winds I saw a few people fly into the air and be flung past me like they had been picked up in a tornado and then released. I knew that the storm would soon reach me but, I was very calm and in a state of awareness of things as they were happening. There was a sadness in me for those who didn’t know, or had refused to learn the things they needed to. The hour had passed. . . . I became grateful for all the trials, and extreme moments of hardship, I had passed through. I was grateful for the moments of my deepest sorrows where I had a gained my knowledge that I am always okay because I am known by The Lord. Just as the winds of the storm was about reached me I was lifted up. Not flung but peacefully lifted. I didn’t hear the sounds of the destruction below me. Instead there was a whooshing sound. White noise,if you will, protecting me from it all. I began traveling, although not due to my own effort. I became aware that I was being transported by two beings whose mission it was to do so. They were lifting me via cords underneath my arms. I didn’t feel the cords or see the beings. It was all very comfortable. Again I felt a sadness that so many others could not experience this amazing experience. Eventually I was gently placed down on a beach where it was safe, peaceful, happy and completely removed from all the turmoil that I had just been taken from. There were children all around who were unaware of any struggle or strife. A tanned, leathery skinned, elderly caretaker came to me. I looked at him and without words I said, “This is Zion isn’t is . . . . I am HERE!” He smiled and nodded his head as if to say, “Yes you’ve made it’. You’ve made the journey and are now a part of Zion.” I fell to the ground and wept in gratitude, wonder, and awe at the realization of it all. The thing that keeps hitting me over and over is that I had no fear anywhere in my being. I didn’t know my fate but I knew everything was according to God’s will and plan. I have used the gift of this dream several times over the week. There have been events could have easily caused fear due to uncertainty and circumstances beyond my control. I have exercised my faith by drawing upon the feeling of the complete trust I had so that my peace, and therefore sensitivity to the spirit, has only had a few vibrations run through it instead of an all out earthquake. There seems to be a war going on between to the two sides right now. The adversary is using deeply held triggers to shake me, and The Lord had sent me a precious gift of understanding and clarity of his power. I choose the gift! It has been a wonderful experience to draw upon. I had complete trust. . . .I know what it feels like. I can completely trust in all things, in all places if I choose to, and work diligently to be pure in heart. I appreciate so much all that you are doing and have done to carry this message to so many. I know this may be too long to post. Even if only you and Spencer read it I am grateful there is a place that is safe to express these beautiful precious gifts from Father. I feel His spirit, will, and power here. Thank you so much for sharing your dream. It was a welcome treat to read before retiring to bed. Like you, I am grateful for the insights others post here to the Unblog. It’s comments like yours which are selflessly shared and utterly uplifting that often give me a taste of what Zion will be like, where we all share for the betterment of others. I’ll try to remember your dream here when I encounter potentially fear-inducing events. I look forward to shaking your hand in Zion. John once talked about being gospel warriors, and this is a view that I find so important. Often times there are the two extremes, those that merely trust in the arm of flesh by following men, or those that totally condemn leaders of the church and ignore all what they teach. To be gospel warriors we should never rely on the flesh, but as Eric explained so well, trust in the Lord. Just by living in this world we grow up with the precepts of men, and we only can free ourselves by coming unto Christ and by taking the Holy Ghost as guide. Nevertheless, a couple veres later we learn somthing else.. in vers 31 it says: “Cursed is he that putteth his trust in man, or maketh flesh his arm, or shall hearken unto the precepts of men, SAVE their precepts shall be given by the power of the Holy Ghost”. There are many leaders that teach the precepts of God, and it would also be wrong to ignore their message just because these teachings come through man. We are not to follow the precepts OF men, but to follow all true teachings also when they come THROUGH men. As John thaught, we need to be gospel warriors, which to me means that we are to be independent from other people in following Christ, we follow all truths whereever they come from, and don’t get shaken when leaders do err. Thank you so much for this post, it was a wonderful reminder. The biggest message I got from reading “Visions of Glory” was to put my trust in God and become spiritually prepared. My husband and I watched “Titan Missionaries from Olympus Class of 2012 Opening Mission Call” on YouTube. It is so spiritual to watch the excitement in the voices of these youth getting their call to serve. You just get an overwhelming feeling with the new age for missionary service that our Heavenly Father is preparing ever more of this generation to trust in Him for what is coming! Feel that and you see the light illuminating in a pillar before them, and know God is preparing the way. Carol, I loved that video! It is amazing to watch the youth rise above the “world”. I forwarded it to quite a few friends/family. Strong spirit and very emotional. It was no use trying to hold back the tears. Thank you. Several years ago as I was reading the account in 3 Nephi ch.8 about the destruction a the time of the Savior’s death, I was struck by the statement in verse 21 that fire could not be “kindled with their fine and exceedingly dry wood”. I realized that those who had been saved believed the prophets and had that wood reserved specifically against the darkness they believed would come. However, they needed to learn faith in the Lord, not their own preparations. This was another confirmation to me that the Lord wants me to have faith in him alone. Otherwise, my preparations might become idols to me, and my fear of losing my preparations block the spiritual promptings that might come on how He would have me use them according to His will. Wow, beautifully said! Your thoughts are exactly what I needed to read today. Thank-you!! Maybe it’s just me? I LOVE Spencers and Johns book. LOVE IT!! But…..I got the impression that those with the “red ticket” were few and far between. I hope and pray that we all get to accompany people like Spencer and Rachel to Zion but I just don’t see it. I have had experiences where I have asked the Lord to take away a vision that was scary or frightening and he didn’t. So then I asked him to help me know how to prepare for it. Even Spencer started out with supplies, that cool truck, gas, food, barter items, guns etc… I wish I had enough Faith to think that the Lord will take care of all of my Familys needs but I just don’t think that’s realistic. Look what Spencer had to go through to get to go and look where his office ends up being. He is a very special man with a stunningly beautiful and incredible experience. This post was timed perfectly for me today. Thank you for following the prompting to write what you have. I am actually exactly at the point in the book where “Rachael” displays this amazing faith and deflects the attack. For some reason, this portion of the narrative happened to couple with some fears and uncertainties about my own future today—a perfect storm of sorts. The spirit had been saying to me, though, to set those things aside and have faith. Your message of faith in the Savior inspires me and reminds me that I can do all that will be asked of me if I rely upon Him—and Him alone! I am grateful and feel so privileged to be learning this lesson now, regardless of how much faith I feel I have had in Him in the past. Like repentance, the journey upward is one of pure joy when begin to see with spiritual eyes. Eric, thank you for the wonderful reminder. When the events you mention come to pass, I pray that your faith in God will not fail. Thank you Eric for your continued inspiration. There is light in the darkness yet! Thanks so much for this timely reminder! Even now the burden of Babylon presses upon us, and it thickens each day…..a blessing in disguise, I suppose as He is the only one who can deliver our impoverished souls from the heavy weight of worldliness.. Our Savior once asked “will Ye also turn away?”…my heart cries out, to whom else would I go?….for all who are distressed, Christ is the only answer, our only hope, our only refuge. “for all who are distressed, Christ is the only answer, our only hope, our only refuge” — beautifully worded, Kate. Thanks so much. Do most people believe we should only (ultimately) trust God? I sure hear an awful lot of testimonies about the Church and the prophet. Sometimes they precede a person’s testimony of the Lord. Thanks for this post Eric. I appreciate what you saw in the book, and have born witness to. I have felt a similar impression in my soul. Thanks for sharing. This is exactly what I got out of reading “Visions of Glory”. Trust in The Lord! Thanks, Eric, for combining those excerpts from the book that teach this. We need not ever fear but stay with the power of Love. What a great post – and as always, coincides with the impressions I’ve had as of late. Eric – you also have a gift with words. Thank you for sharing that gift, coupled with spiritual insights. What a huge compliment! Thanks so much. Words are such a powerful thing. In my opinion, they are among the most creative forces in the universe. With words, one can create or destroy, kill or raise to life (both physically and spiritually). Thank you so much for specifically bringing this topic up. In my journey, I have been inspired by the Lord to divest myself of all fixations on material things and focus on gaining spiritual ability and power. Your passages you shared from Spencer’s account stood out to me as well. Go in faith my brother. Thank you Eric. Your post resonates loudly with me. The sooner we can learn to trust completely in our Savior, the sooner we will be prepared to make the journey to Zion. Eric, I’m so thankful for this. My wife and I are reading Visions of Glory now. We haven’t gotten to this point yet. I know that what you say it true, though – only by sharpening our ability to hear the spirit, by humbling ourselves to the point of complete obedience, and trusting in the Lord above all things can we be truly prepared for what is surely coming. Eric, your perspective rings very true! I will continue to follow the Church’s guidelines on temporal preparedness. However, truly finding the Lord, as the people in your quotes did, is where I sense my real preparedness efforts need to be. Thank you. Eric, thanks for the reminder about trusting in God. For me, I find that all of my anxieties or bad feelings in life come because I put my trust in (and maintain my fear of) men. This is particularly true during the middle of the work week when I get bogged down and worry about things like finances, not disappointing my boss, etc. When this occurs, I tend to over-think things, and I forget to listen to and rely on the Lord. I’ll keep trying. Also I appreciate you keeping up the UnBlog even after John’s passing. I miss his words, but I eagerly look forward to posts by you and/or Spencer. Thanks again. Thanks, Steve. John’s words are very much alive, now on both sides of the veil. Although John’s mission here is over and his mission over there has just begun, I know for a fact he still has some influence over his Unblog here.